Looking for a powerful routine to get your students thinking and communicating mathematically? A new school year is a great time to try a new routine! Number talks is one of my personal favorites and one that will give you a lot of "bang for your buck." Number talks is a powerful routine to help students develop flexibility with numbers and solve basic problems without using paper-and-pencil. In addition, students increase their ability to articulate their thinking and refine their mathematical communication skills through the use of number talks. Learn more about how to get started using number talks in the classroom here. 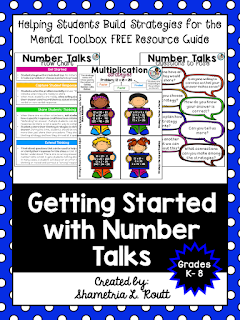 Grab a free copy of my "Getting Started with Number Talks" pack here or click the image above!